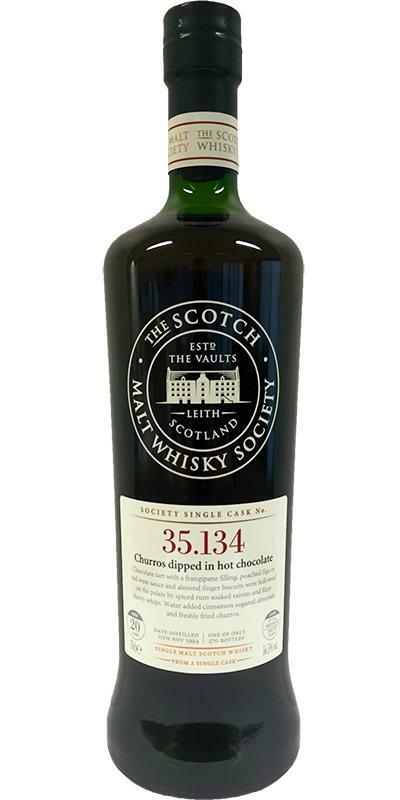 This whisky is called “Churros dipped in hot chocolate” and comes from a first fill toasted oak hogshead. Only 270 bottles were made. Sweet dried fruits with hints of floral notes in the smell. Some oak and oak spices comes forward after some minutes in the glass. You really get that it is first fill in the taste! Loads of flavours comes forward – oak, oak spices and again some floral notes. Some lemon cake as well. The floral notes really comes forward in the finish, but is then overpowered by the oak and oak spices again. It´s quite the rollercoaster! After it opened up, I couldn’t stop smelling it! It is very good quality, but the floral notes got a bit too much for my flavour profile, but if you don´t mind that/like it, then it’s absolutely a whisky you should try! I will give this 87/100 (23/21/22/21).